Does The World Have a Golden Calf? You are at:Home»Articles»Does The World Have a Golden Calf? In Scripture, we know that Moses’ Brother, Aaron – was a Levitical Priest – and he built a golden calf. This visible golden calf served as a false object of worship for the people encamped at the base of Mount Sinai. It is interesting that the image that Aaron built was not a mature creature, but a calf. It is assumed that this calf was the calf of oxen. Yet, a calf could be that of a sheep – animals more prominent in those days. While the calves of sheep are called lambs, those lambs are nonetheless calves. What does Moses say the Israelites asked Aaron to make for them at Exodus 32:4? It is not as the many so-called religious organizations teach. They would have you believe that the Israelites were to have Aaron construct Egyptian gods. No, Israelites did not worship the gods of Egypt when they were enslaved there and they did not worship them when Moses led them out. No, the golden calf would be for them a visible representation of the God of Israel. I believe in more modern times that the so-called religious world of Christianity has stood up its own false object of worship; a golden calf. This visible image was fashioned by the so-called religious authority and millions of people in the world look to this false image as an object of adoration and even as God Himself. This false image is called in Scripture The Lamb of God; The Word of God; and The Son of God. It is not that the Scriptures are wrong in stating this; it is that mankind has misrepresented this person and fashioned him into a form that he is not. What is that false form? A flesh and blood person. Not only that, in a form that resembles the creators of the image: Caucasian. This is the false image and form of the modern day golden calf that has become an object of adoration and worship in the world. Why is this image a false one? Because no one in modern times has seen the one that The Most High God sent. Therefore, it is not possible to create an image of him. Secondly, he is no longer with mankind as a flesh and blood entity. At his ascension “back into heaven,” he exists now as a very powerful angelic spirit creature: The form he had before he was sent into the world by his heavenly Father. Thirdly, the Most High God said at Exodus 20:4-5 that images of things in heaven or on earth or in the waters are not to be made and they are not to be worshiped. This visible representation of the Lamb of God is false; he is not a man. He is not a White man, not a Black man nor the likeness of any race of man. He is no longer flesh and blood as he was more than 2000 years ago. So this false visible “golden calf” or “golden lamb” that has been so indelibly implanted in the minds of millions is a creation of mankind and it has been an object to deceive and mislead. The True God and His Son are in a form that cannot be seen. 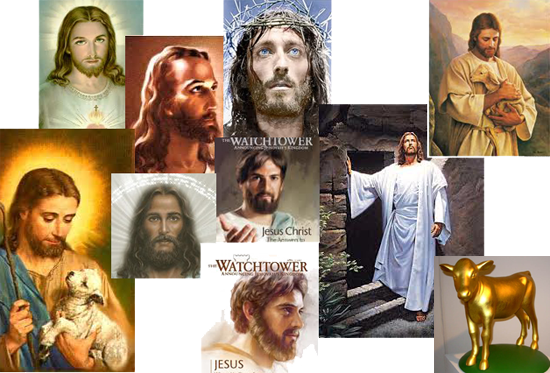 Yet, the Son of God is portrayed as seen in the images shown on this page. As a person of African descent myself, I reject such images of my Master as being a “White man” or one of European descent or one of flesh and blood form. I know that my Master is not a man but the invisible Son of the living God. This golden lamb that the world has constructed and calls Jesus is a false image and has caused the world of mankind not to worship the Father in spirit and truth. It has caused the world not to exercise the required faith needed to worship the Father. Instead, it has caused the world to rely on visible things – the things seen with the eye, golden calves – as objects of worship. Previous ArticleWhat Is The Opposite of Everlasting Life? Did Moses Write the Bible?